High resistance to hydrolysis, compared with adipate based polyester polyols. This is effected by the low acid values and high hydrocarbon spacing between ester moieties. Excellent service life when compared with other classes of polyols. The polycaprolactone polyols can be custom tailored to meet individual performance requirements in highly demanding applications. They are the polyester class that produces the highest physical and mechanical properties in polyurethane elastomers. Polycaprolactone based polyurethanes incorporate many of the benefits assigned to PTMEG polyols such as good hydrolytic stability, low temperature flexibility, excellent flex fatigue life and good elastic memory. The linear and symmetrical polycaprolactone repeat structural unit produces soft blocks with high molecular-level interchain packing and efficient phase separation from the hard block segments. This enhances flexibility, toughness and elastomeric characteristics. These structural features of the polycaprolactone polyols, and the even-number carbon spacing, are responsible for exhibiting performances that surpasses that of adipate-based polyester polyurethanes. The chart below is a qualitative delineation of the relative performance of three generic classes of polyols in polyurethane elastomers: polycaprolactones, adipate polyesters and PTMEG. The designation of “Best-in-Class” refers to the highest performance within these three classes. Chemical Resistance relates to oils, fuels and hydrocarbon solvents. There are two types of Abrasion Resistance: sliding and impingement. Sliding refers to scraping and rubbing abrasion while impingement refers to particles striking the urethane surface. Polyester based polyurethanes display higher tensile and tear resistance, and exhibit excellent sliding abrasion resistance. This makes them ideal for applications like belt scraper blades and chute liners. PTMEG, due to its’s higher resiliency, offers better performance in applications where impingement abrasion is the dominant form of wear. This makes PTMEG based polyurethanes the choice for sandblast curtains, slurry pipe liners and surfaces that are subject to impact. The Processing advantages of the polycaprolactone based urethanes derive from the low polydispersity of the polycaprolactone polyols and the lower viscosities of the attendant prepolymers and TPUs. The polycaprolactone polyols are available as diols, triols and tetraols with both liquid and wax-like appearances and with molecular weights from 310 to 4000. The polycaprolactone polyols are produced by a unique process in which a glycol initiator is reacted with a six-carbon cyclic-ester monomer, caprolactone. A wide variety of glycol initiators are used, providing one significant custom design feature of this unique class of materials. See the Figure below. This is contrasted with adipate polyester polyols which are the reaction product of a di-carboxylic acid and a diol, triol, etc. Carboxylic acid moieties, such as adipic acid, are not intermediates in the lower reaction temperature and well controlled ring opening” process for producing the polycaprolactone polyols. The chemistry differences used to make these two classes of polyesters account for the uniqueness of the polycaprolactone polyols, including their very low acid values (contributes to hydrolytic stability), low polydispersity (contributes to low viscosities) and perfect primary hydroxy end-functionalities (good stoichiometry control with reactivities that can be adjusted to meet your specific application requirements). The symmetry of the caprolactone repeat unit enhances interchain packing in the soft-block segment of a polyurethane or polyurea, which increases flexibility and elastomeric characteristics. The caprolactone polyols are ideal building blocks in MDI and TDI based polyurethanes designed for: abrasion, chemical and impact resistant industrial coatings; polyurethane dispersions (PUDs); flexible and weather resistant coatings on synthetic leather and textiles; inks; cast parts used in mining and oil field operations, such as particle separation screens, belt scrapers and conveyors, where good wear, cut & chip, flex fatigue and oil/solvent resistance is required; cast wheels, sprockets and rollers requiring durability and mechanical toughness; environmentally resistant adhesives; durable hydraulic and pneumatic seals requiring hydrolytic and chemical resistance; etc. Daicel Corporation produces a broad portfolio of Placcel® polycaprolactone polyols including standard polycaprolactone diols with molecular weights from 530 to 4000 and initiated with various glycols to achieve a variety of property enhancements. 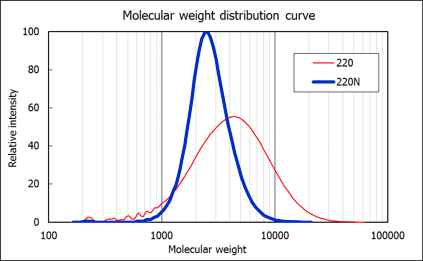 Other grades include an N series with narrow molecular weight distributions (e.g. Mw/Mn of ~ 1.24 – 1.34 vs. 1.88 – 2.00 for standard grades); polycaprolactone triols terminated with three primary hydroxyl moieties and molecular weights of 310 to 2000; a liquid polycaprolactone tetraol with a molecular weight of 1030; high hydrolysis resistant diols that are liquids; and a number of liquid polycaprolactone diols designed for easy handling. The GPC data below contrasts the narrow molecular weight distribution of the N series of a Placcel® diol, 220N, with a general grade of polycaprolactone diol, Placcel®220. The Placcel®220 N exhibits a viscosity of 242 mPa●s at 75 °C; Placcel®220 (standard grade) exhibits a viscosity of 372 mPa●s at 75 °C. The standard grades of the polycaprolactone polyols have MWDs and viscosities that are similar to those of the PTMEG diols (MWD 1.88 – 2.00), while the N grades are much narrower. The adipate diols show broad MWDs, around 2.50, and high viscosities. A unique grade of the polycaprolactone polyols is Placcel®410, a liquid, primary tetraol with a molecular weight of 1030, an equivalent weight of 218 KOHmg./g. and a viscosity of 272 mPa●s at 60 °C. Applications are as a crosslinkable reactive diluent in highly resistant two component coatings. As an additive to acrylic polyols crosslinked with melamine or isocyanate chemistries, the Placcel410 reduces the viscosity (or lowers VOCs), and improved hydrolytic, chemical, impact and abrasion resistance. The table below summarizes the characteristics of three specific grades of 2000 MW polyols: Placcel®220CPT, initiated with neopentyl glycol and possessing a low acid value of <0.02 KOHmg./g. ; a polybutylene glycol adipate; and a PTMEG 2000 in MDI-polyurethane elastomers chain extended with 1,4-butanediol. As can be seen, the Placcel®220CPT would be the polyol of choice for applications requiring good environmental resistance and flexibility over a broad temperature range. For products requiring a similar performance set with excellent tear, cut & chip resistance, we would specify a linear polycaprolactone diol with strong intermolecular forces in the soft block and good microphase separation. Examples are Placcel®210B or 220B. For resistance to solvents like acetone and toluene, we would recommend an MDI based polyurethane using Placcel®205H diol, formulated with the addition of a multifunction crosslinking agent. Thus, a robust set of performance parameters can be achieved through the proper selection of the polycaprolactone polyol and urethane formulation.